Robin has dedicated her life to working in “helping” professions, using her skills as an advocate to improve the lives of those in her community and beyond. Robin has been a vocal and determined fighter on behalf of Illinois families, with a proven track record of delivering real results. Since coming to Congress, she has worked to promote job creation in the Second District, helping advance jobs bills for working families, and hosting annual job fairs that have helped employ thousands of our neighbors. She stands up to the gun lobby, authoring The Kelly Report on Gun Violence in America, and helped organize the Gun Violence Prevention Sit-In in Congress for stronger gun safety laws. Robin has worked across the aisle to advance common sense health and consumer protection legislation. Through her “Robin’s Reader’s” initiative, she has secured thousands of books for local schools and libraries, and since going to Washington, has recouped millions of federal dollars for Second District Families. 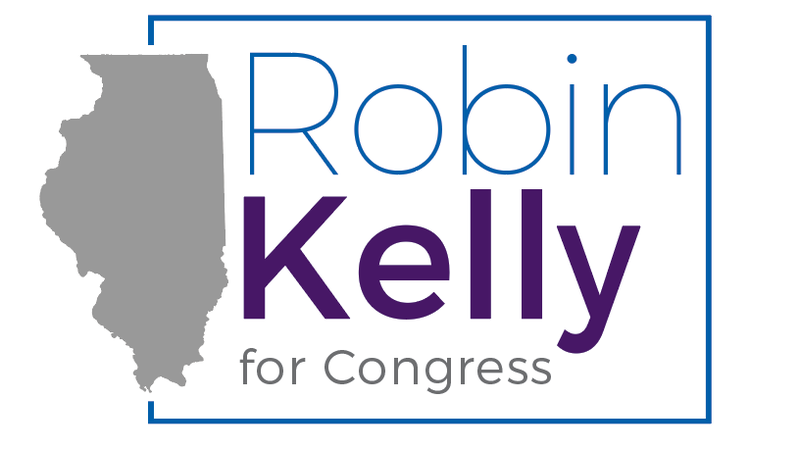 Robin began her career in public service as the Representative of the Illinois’ 38th House District in the General Assembly (where she served from 2002-2007). In 2007, she became the first African American to serve as Chief of Staff to a constitutional officer in the state, when she was selected to help lead the Illinois State Treasurer’s Office. There, she worked tirelessly to make Illinois a better place to live, work, and raise a family – promoting financial literacy, innovative small businesses strategies, and working to eradicate food shortage areas. Robin also served as the Chief Administrative Officer of Cook County where she managed day-to-day operations and policy implementation for the county. Robin received her B.A. in psychology and M.A. in counseling from Bradley University in Peoria and earned a Ph.D. in political science from Northern Illinois University. She is an active member of the Sigma Gamma Rho Sorority Inc.
Robin is married to Dr. Nathaniel Horn and has two adult children: Kelly and Ryan and one grandson. 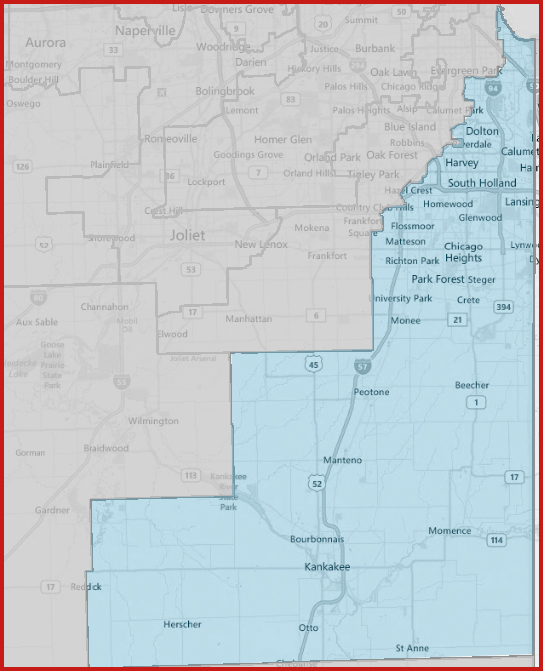 Illinois’ 2nd Congressional District is adjacent to the 1st District to the north and west, the 11th District to the south, and Indiana’s 1st District to the east. The district’s northeast border follows Lake Michigan’s shoreline for several miles. The district was created following the 1830 U.S. Census and came into existence in 1833, five months before Chicago was organized as a town. The 2nd Congressional District initially included Southeastern Illinois until 1853 and stretches of Northern Illinois until 1873. It has been based in Chicago since 1853, and part of the southeast side since 1903. Local educational institutions include Governors State University in University Park, Chicago State University in Roseland, Prairie State College in Chicago Heights, South Suburban College in South Holland and Olive-Harvey College, a Chicago city college, in Pullman. The University of Chicago is directly west of the district’s northern end. Hospitals in the district include Ingalls Memorial Hospital in Harvey, Advocate South Suburban Hospital in Hazel Crest, St. James Hospitals in Chicago Heights and Olympia Fields, Advocate Trinity Hospital in Calumet Heights, La Rabida Children’s Hospital in Woodlawn, South Shore Hospital in South Chicago and Roseland Community Hospital in Roseland. The Museum of Science and Industry is located almost at the district’s northern tip. Various areas of the Cook County Forest Preserves are scattered throughout the suburban part of the district, particularly in the area northeast of Chicago Heights. Other notable business and industrial presences in the district include Jays Foods, a manufacturer of snack foods based in Pullman; the Norfolk Southern Railway; Allied Tube and Conduit, a piping and electrical manufacturer in Harvey; and UGN Inc., an automotive soundproofing manufacturer in Chicago Heights. I’m proud that my work has won the endorsements of so many remarkable members of our community from President Obama and my colleagues in Congress to community leaders, local pastors and neighborhood activists who are fighting for a better tomorrow. I believe that one of the most important obligations elected officials have is to be accountable and accessible to the people they serve. That’s why as your Congresswoman I pledge to run a fully-engaged constituent services office that is responsive to you. My door will always be open. And when I’m not in Washington, D.C. fighting for you, I’ll be traveling the District meeting with you, hearing your concerns and using them to inform the work I’ll do on your behalf. I’m calling on you for your support, and I pledge that as your Congresswoman you’ll always be able to call on me for mine.